Max Gradel struck late to earn Ivory Coast a draw with Mali and keep alive their hopes of reaching the Africa Cup of Nations quarter-finals. Mali had looked to be heading for victory, thanks to a superb half-volley from Bakary Sako after seven minutes. But the equaliser came on 86 minutes when Gradel slotted in from 12 yards. Earlier, Ivory Coast were denied a penalty when Wilfried Bony appeared to be upended by Molla Wague, while Kolo Toure headed against the bar. Those two first-half incidents summed up the match, as the Elephants were frustrated for long spells. And once again they needed to recover from a poor start as they fell behind after only seven minutes. Mali launched a swift counter-attack and worked the ball out wide to Sambou Yatabare whose far-post cross was met brilliantly on the half-volley by Wolves winger Sako, his left foot sending the ball low into the opposite corner. It was not until the 25th minute that the Elephants created a clear-cut chance in response. A cross from the left was headed back across goal by new Manchester City striker Bony but Doumbia's attempt at an acrobatic volley was mistimed and poorly directed. 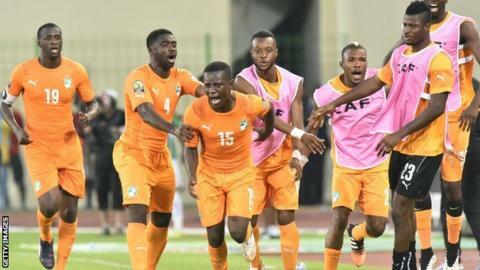 Ivory Coast coach Herve Renard cut a furious figure on the touchline and his rage was further fuelled when Bony looked as though he was impeded by Molla Wague but the referee gave a corner. They almost scored from set-piece but Liverpool defender Kolo Toure's thumping header was superbly tipped onto the bar by goalkeeper Soumaila Diakite. Despite their best efforts, fortune was not favouring the Ivorians and they were incensed when the referee awarded a free-kick in box, penalising Bertrand Bailly who had flicked the ball up to himself to head the ball back to his keeper. Mali could not take advantage, with Sako firing the set-piece against the wall. Opting for a front three of Max Gradel, Bony and Doumbia, Ivory Coast pushed forward in numbers after the break. Yet the equaliser would not come. Bony headed wide from Gradel's dinked cross and then when Bony turned provider, his team-mates were unable to meet his inviting near-post flick-on. From an unfortunate injury Mali took an opportunity to relieve pressure on their defence, taking about five minutes to substitute keeper Diakite for Germain Berthe. Inevitably the delay disrupted the rhythm of the game, both teams struggling to regain their composure. Then with four minutes of normal time remaining, Serge Aurier, a threat throughout, played in Gradel and the substitute clipped a low shot beyond Berthe. "It's a very good point. I think with quite so many chances, we should have scored more than one goal, because we were the better side in the game. "For us it's very important that we give everything and we will fight for it. There are young players, for them it's difficult - but as a team I think we are strong and I believe that we can beat Cameroon [on Wednesday]." "We are very frustrated, because we could win today. It's the second time that we've conceded a goal at the end of the game. But it is not finished, so we're going to try to win the last game. "We are not favourites, but we drew against Cameroon and against Ivory Coast, so that shows people how good we can be." Match ends, Côte d'Ivoire 1, Mali 1. Second Half ends, Côte d'Ivoire 1, Mali 1. Corner, Côte d'Ivoire. Conceded by Sambou Yatabaré. Attempt saved. Sambou Yatabaré (Mali) right footed shot from the centre of the box is saved in the top centre of the goal. Assisted by Adama Tamboura. Delay in match Cheick Tioté (Côte d'Ivoire) because of an injury. Foul by Junior Tallo (Côte d'Ivoire). Adama Tamboura (Mali) wins a free kick in the defensive half. Sylvain Gbohouo (Côte d'Ivoire) wins a free kick in the defensive half. Foul by Tongo Doumbia (Mali). Corner, Mali. Conceded by Kolo Touré. Substitution, Mali. Modibo Maiga replaces Mustapha Yatabaré. Sambou Yatabaré (Mali) is shown the yellow card for a bad foul. Cheick Tioté (Côte d'Ivoire) wins a free kick in the defensive half. Foul by Sambou Yatabaré (Mali). Goal! Côte d'Ivoire 1, Mali 1. Max Gradel (Côte d'Ivoire) left footed shot from the centre of the box to the centre of the goal. Assisted by Serge Aurier. Eric Bailly (Côte d'Ivoire) wins a free kick in the defensive half. Foul by Seydou Keita (Mali). Mamoutou N'Diaye (Mali) wins a free kick in the defensive half. Substitution, Côte d'Ivoire. Junior Tallo replaces Wilfried Bony. Substitution, Côte d'Ivoire. Salomon Kalou replaces Wilfried Kanon. Cheick Tioté (Côte d'Ivoire) is shown the yellow card for a bad foul. Foul by Cheick Tioté (Côte d'Ivoire). Mamoutou N'Diaye (Mali) wins a free kick in the attacking half. Foul by Siaka Tiéné (Côte d'Ivoire). Sambou Yatabaré (Mali) wins a free kick in the defensive half. Corner, Mali. Conceded by Eric Bailly. Seydou Keita (Mali) wins a free kick in the attacking half. Max Gradel (Côte d'Ivoire) wins a free kick in the defensive half. Foul by Yacouba Sylla (Mali). Substitution, Mali. Tongo Doumbia replaces Bakary Sako. Seydou Keita (Mali) is shown the yellow card. Foul by Eric Bailly (Côte d'Ivoire). Mustapha Yatabaré (Mali) wins a free kick on the left wing. Attempt missed. Wilfried Bony (Côte d'Ivoire) header from the centre of the box misses to the left. Assisted by Yaya Touré with a cross following a corner. Corner, Côte d'Ivoire. Conceded by Salif Coulibaly. Foul by Max Gradel (Côte d'Ivoire).